Federal Judge Emmet Sullivan of Washington, DC, who determined that the new restrictive interpretation of the right to asylum by former Attorney General Jeff Sessions was “arbitrary and capricious and contrary to the law,” added that some of Trump’s asylum policies are “inconsistent with the intent of Congress as articulated in the [Immigration and Nationality Act]” and that it is “the will of Congress – not the whims of the Executive – that determines the standard for expedited removal,” i.e. without an appearance before an immigration judge. 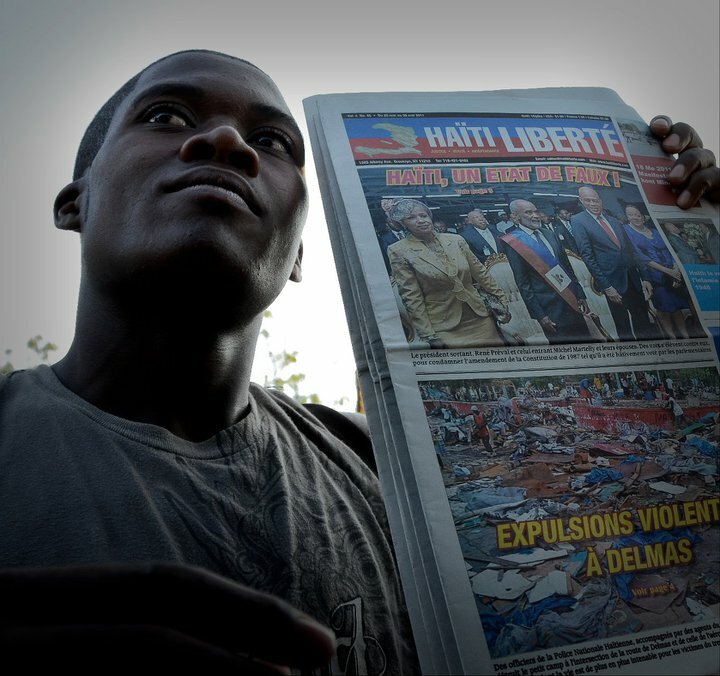 Kathy Nuebel Kovarik feverishly sought to know how many Haitian TPS holders were criminals or receiving public support. First, someone with a criminal record could not have received TPS, and a TPS holder cannot receive public assistance. Then, says Alicia Caldwell, a reporter specializing in immigration at the Wall Street Journal and the Associated Press, which obtained these exclusive internal memos: “The request for criminal data for an entire ethnic community is unorthodox. 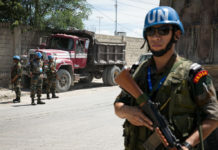 Federal law doesn’t specify it should be a consideration for Temporary Protected Status, and the government has never said it would use a community’s behavior in deciding if a country’s citizens should be allowed to stay.” As Maria Odom, a former Citizenship and Immigration Services (USCIS) ombudsman in the Obama administration, said: “You should not craft a humanitarian policy based on the few.” And she confirmed that her services had already checked whether the TPS applicant had a criminal record or not. Another immigration reporter, Dara Lind of Vox, a political news website founded by Ezra Klein, a former Washington Post reporter, writes that “It’s entirely legal for the White House to influence decisions made by the Department of Homeland Security […]. But there’s a difference between influence and control. When it comes to TPS, federal law is clear: The decision about whether a country gets TPS, or whether a country that has it gets an extension, belongs to the homeland security secretary, not the president.” We saw the case where the White House had them lower the period from 18 months to 12 months for Nicaraguan TPS. the Trump administration is very careful not to use terms that may be illegal. Obama had already tried this in 2015, but Federal Judge James Boasberg ruled that immigrants can only be imprisoned “based on whether the immigrant posed a threat to the community or a flight risk,” and not just for deterrence. Yet it is deterrence that is involved in the case of separation of families under Trump. 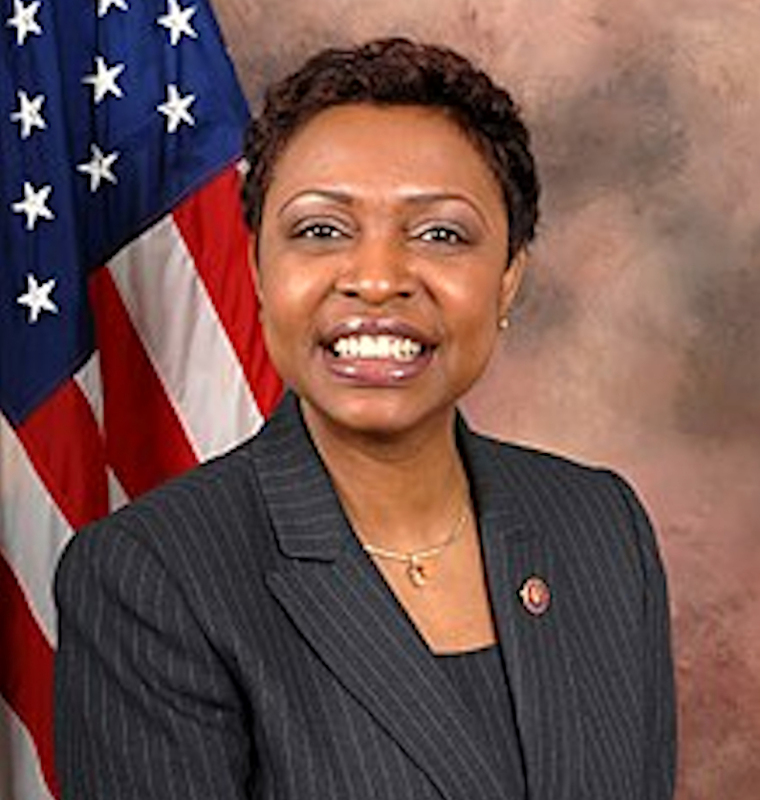 We find the same opinion in Congress with New York Democratic representative Yvette Clarke: “I think that we really have to knuckle down and bring our nation into a 21st century immigration system. It’s ridiculous the way we are operating right now.” She has proposed several bills to prevent TPS recipients from being deported, but none has been successful so far. TPS is particularly outdated. Is it normal to allow a person to live temporarily in a country, i.e. to settle, find a job, sometimes open a business (*), pay taxes, develop relationships, both personal and social, make children, and then – sometimes after 20 years, as in the case of Nicaraguans – they are told to get out of the country? What if they have children, who were born and raised in the United States, without any exposure to life in the parents’ country? What is certain is that Congress, the author of the 1990 TPS legislation, should now complete its work by normalizing the situation of both holders of TPS and DACA – these illegal youths – and offer them a path to permanent status. In the fall of 2017, the Institute for Justice & Democracy in Haiti reported that “At least 100 bipartisan members of Congress, the Republican Governors of Florida and Massachusetts, 15 big city mayors, 416 faith leaders, 550 U.S. physicians, eight major editorial boards in at least 15 editorials, and many others have urged a generous Haiti TPS extension. Recently the eight U.S. Senators from Florida, Massachusetts, New York and New Jersey urged an 18-month extension, joining the U.S. Conference of Mayors, Haiti’s government, the Philadelphia City Council, county commissions, all 49 members of the Congressional Black Caucus, and many others in doing so”. Note that these politicians are not totally altruistic. 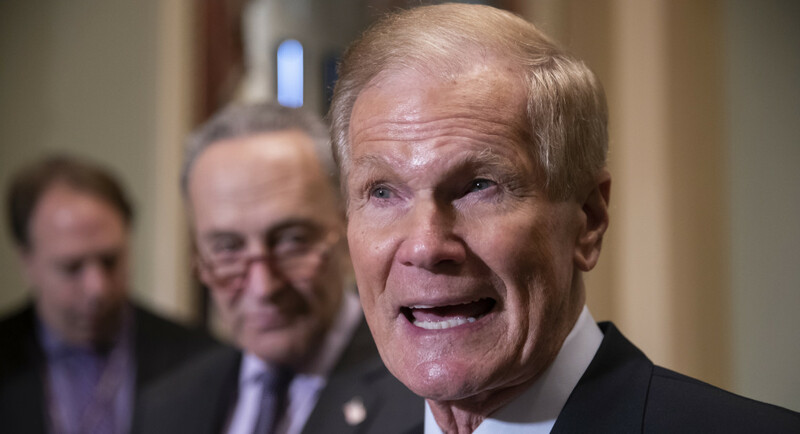 Florida’s Democratic Sen. Bill Nelson wants a solution because “a mass exodus of 60,000 Haitians from the U.S. would have ripple effects on the economies of both South Florida and Haiti.” Most Haitian immigrants live around Miami – and Florida has the second highest TPS population (60,969) after California (80,636), out of a total of 436,866 (October 2017). 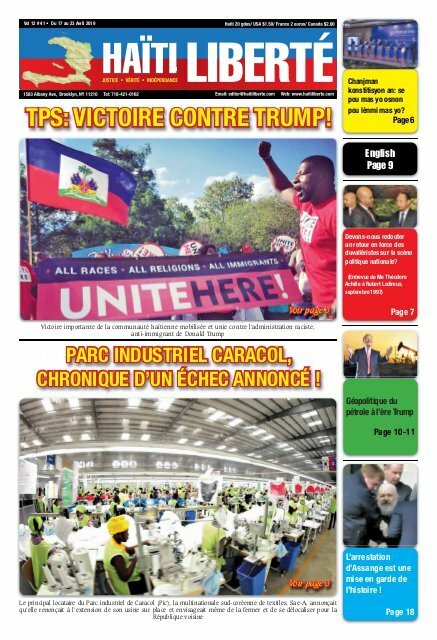 For its part, on Oct. 26, 2017, the U.S. Chamber of Commerce urged DHS Secretary Elaine Duke to extend TPS because a study by the Immigrant Legal Resource Center shows that the TPS cancellation for Haiti, El Salvador and Honduras would result in a $45.2 billion reduction in GDP over the next decade. The State Department also does not take selfless positions: its first priority is always to protect U.S. national interests. In this case, the diplomats pointed out that sending back half a million people is “against the interests of the United States” and could “destabilize the region and trigger a new push of illegal immigration.” We see the result right now. 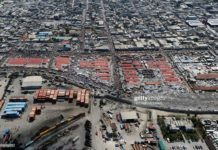 A caravan of a thousand people, precisely from El Salvador, Honduras and Guatemala, entered Mexico through Guatemala to join the approximately 7,000 migrants already massed on the U.S.-Mexico border, including 347 that crossed into the U.S. on Jan. 18th through seven tunnels under the border fence. 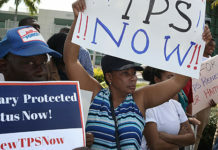 Given this situation, at the time when the DHS was to rule on TPS, in October-November 2017, the entire Miami delegation in Congress, both Democrats and Republicans, was in favor of a bill by former Republican representative Carlos Curbelo (opposed to Obamacare but in favor of the environment) that would allow all TPS holders to be eligible for permanent residence, Haitians, Salvadorans, Hondurans, and Nicaraguans. Its initials were the 2017 ESPERER law, Extending Status Protection for Eligible Refugees with Established Residency. 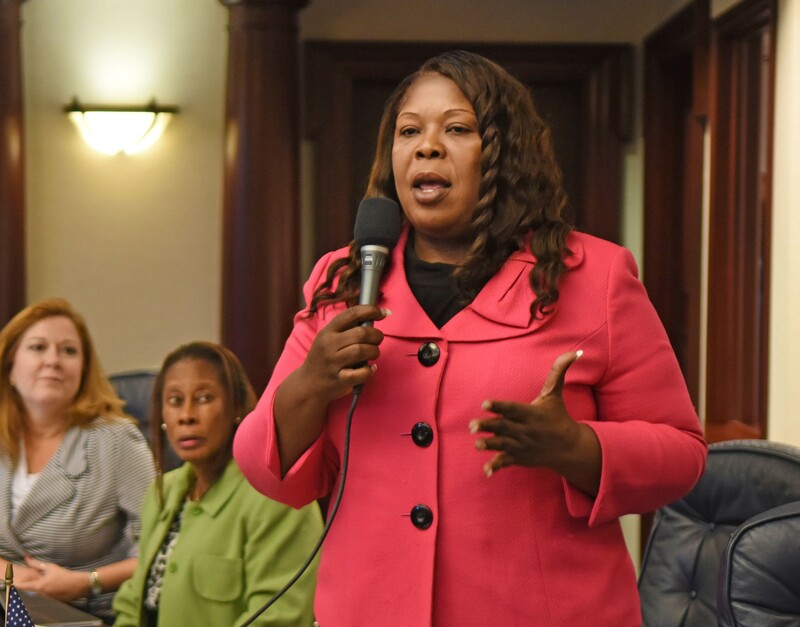 Both this bill and that of Florida Senator Campbell, died – the official term – in the respective judicial committees of the U.S. House of Representatives and the Florida Senate. It’s not just a matter of political bargaining. As Ileana Ros-Lehtinen, Miami’s former Republican representative, who signed several pieces of legislation offering TPS holders permanent residency, said: “most members of Congress are unaware of the issue” ! The majority of Congresspeople “would not know what TPS is if asked about it, and there isn’t an appetite from Republicans to give TPS recipients a path to permanent residency. There just isn’t room in people’s hearts right now,” she said before retiring this January after 30 years in politics. The same is true for the broader public. 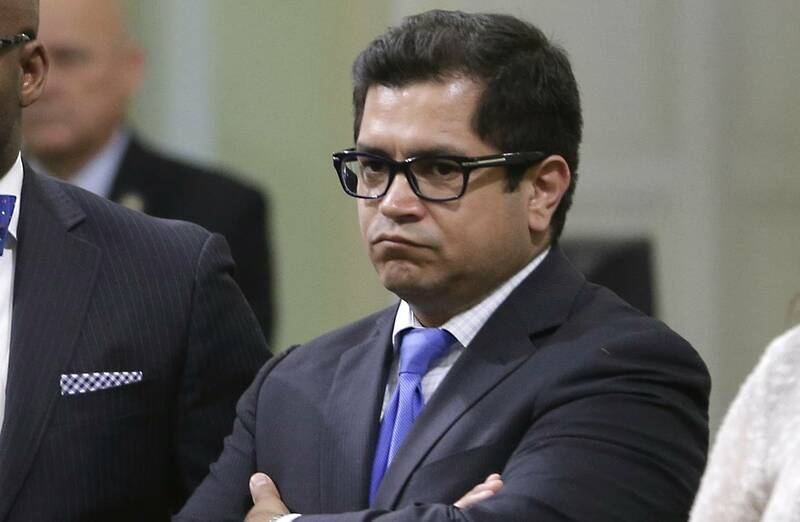 As Jimmy Gomez, the Democratic representative for California, where the majority of TPS and DACA live, says, “it is harder to get the general public to understand the difference between the Dreamers [DACA] and those of TPS,” as the first are young and have received lots of media coverage. Hence the lack of interest from representatives and senators who react mostly to their constituents’s pressure. The Trump administration also appeals to Congress. At our trial, the defense firmly referred to Congress as the sole authority – instead of the judge – able to challenge the decision to terminate TPS as well as change TPS’s statutes. The same reference to Congress is noted in several TPS or DACA terminations by DHS. After ending Nicaraguan and Honduran TPS: “Acting Secretary Duke calls on Congress to enact a permanent solution for this inherently temporary program.” After Kirstjen Nielsen, Elaine Duke’s successor, ended Salvadoran TPS: “Only Congress can legislate a permanent solution addressing the lack of an enduring lawful immigration status of those currently protected by TPS who have lived and worked in the United States for many years. The 18-month delayed termination will allow Congress time to craft a potential legislative solution.” The same for DACA, whose Sep. 5, 2017 termination by Duke triggered a six-month deadline for Congress to find a lasting solution. (Which it did not do). As early as February 2017, just after he became president, Trump announced that policy in which a visa applicant earns points based on his/her age, education, and knowledge of English. An important feature: if he/she is accompanied by the spouse, it is a negative point! This also means, in theory at least, that these workers will never apply for public assistance, will pay more taxes, and will come from so-called developed countries. The administration has not given all this policy’s details but we can be sure it will be skewed in favor of white immigrants. This is indeed a totally new approach to immigration to the United States which for half a century has favored the family-based unification immigration, i.e. from people who already had a family member with U.S. citizenship, which resulted in a sharp increase in immigrants coming from Asia and Latin America. This desire to push Congress to action uses TPS and DACA recipients as bargaining chips and is far from being intended to offer them a permanent solution. It is playing with the fate of a few hundred thousand immigrants to later reject millions more from these same regions. Most recently, we saw this sneaky maneuver when the U.S. government shutdown following the refusal of Democrats to fund Trump’s $ 5.7 billion wall on the U.S.-Mexico border. On Jan. 19, Trump announced a “proposal” to re-open the government: if he received this money, he would give “three years of relief” to TPS and DACA recipients. But if we analyze the Senate’s bill – defeated by 50/47 votes – it “does not extend DACA but rather replaces it with a totally different program that will exclude untold thousands of Dreamers who would have been eligible under DACA,” say two immigration specialists, David Bier of the Cato Institute’s Center for Global Liberty and Prosperity, and Stuart Anderson, director of the National Foundation for American Policy, and a former immigration officer in both the government and Congress. As for TPS holders, only those from Haiti, El Salvador, Honduras, and Nicaragua would be covered. And they would have to pay twice as much, earn at least 125% above the poverty level, repay any lawfully-obtained tax credits – an “unprecedented” requirement in U.S. immigration law – and apply under new criteria that result in “a burden of proof on immigrants to prove many unprovable things.” For example show – “by clear and convincing evidence” – that their employment would not be “contrary to the national interest “! Moreover, “the bill eliminates the availability of TPS for the future by fundamentally altering the current TPS statute,” reserving this status to anyone already legally in the United States when his/her country of origin is designated as TPS! The proposal also restricts the right to asylum, with the effect in practice “to bring an end to asylum for all minors from Honduras, El Salvador, and Guatemala arriving at the U.S. border,” by requiring them to apply for asylum at centers located outside the United States, to have a parent or guardian already in the United States, to wait months, even years, and to be within the limits of a ceiling of 15,000 children admitted per year. In fact, this bill sought to finance the infamous Trump wall by taking TPS and DACA holders with their children as hostages, as well as the furloughed federal government employees. Previous articleSolidarité totale à la révolution Bolivarienne !